Primary, or deciduous, teeth fill the mouth entirely by age 2-3. However, from ages 6-12 you can expect an ever changing scene of both primary and permanent teeth in your child’s mouth. This, sometimes awkward, developmental stages come with its own set up questions and concerns. When permanent teeth grow in crooked future problems can arise, such as problems with speech, problems with chewing, and aesthetic problems that may parents do not wish their children experience. After a primary tooth falls out, or is pulled out, the permanent tooth should follow within a few weeks. 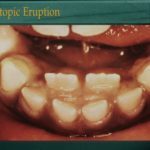 However, sometimes it takes a long time for the permanent tooth to erupt. 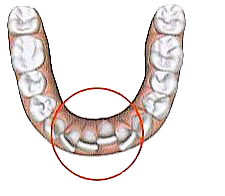 By that time, the other primary teeth or new permanent teeth could have shifted and began to fill the empty space. This is a problem because it can cause the teeth to “crowd” which leads to problems with speech, hindering other teeth from growing in properly, and problems with chewing. Additionally, crowding makes it difficult for kids to brush and floss properly. In rare cases, kids are not born with their canine teeth. This is something that is detectable by x-rays. If you have concerns regarding your child’s permanent teeth call your local dentist. At Soft Touch Dentistry in Sacramento, CA we see children of all ages and have a panoramic x-ray machine for this reason. Pain from when permanent teeth grow in is inevitable and should be expected. Prepare yourself by having Orajel and Ibuprofen stocked in the medicine cabinet. When a primary tooth doesn’t fall out when it is supposed to, the permanent tooth will grow in behind, in front of, or next to the primary tooth. This will cause crowding. Crowding will affect the aesthetic look of your child’s mouth, adversely affect his/her speech, and make it difficult to floss and brush. If you are unable to pull the primary tooth out yourself, seek a dentist’s help as soon as possible to rectify the situation. Wisdom teeth are by far the most painful of all the teeth. 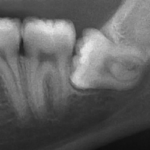 Wisdom teeth may never erupt for your child. Every child is different. However, dentists suggest wisdom teeth should be taken out if the are fully impacted or have the potential to hurt the other molars. Take your dentist’s suggestions seriously. In the event that you have questions or concerns regarding your child’s tooth eruption or when permanent teeth grow in, our Sacramento, CA, dental office is always accepting new patients.